At the fifth annual SAGE Celebration of Achievement, the Healey Education Foundation presented $50,000 in grants to recognize significant improvement in enrollment management and fundraising by its partner schools. The Foundation leadership and staff welcomed 180 guests on October 26, 2017, at the Hyatt at The Bellevue, Philadelphia. Attendees included philanthropists and leaders from 10 award-winning Catholic schools and new partner schools in the Diocese of Wilmington. At the premier event five years ago, 26 schools in two dioceses were eligible for the School Advancement Grants for Excellence (SAGE). This year, the awards were open to 56 schools from: the Diocese of Camden, the Archdiocese of Philadelphia, the Diocese of Allentown, the Archdiocese of Baltimore and the Archdiocese of St. Paul and Minneapolis. In addition to the celebration, the SAGE event kicked off with a 90-minute educational symposium, The Visionary Board: Leading Your Catholic School Due North. The opening presenter, John J. Dilulio, Jr., Frederick Fox Leadership Professor of Politics, Religion and Civil Society at the University of Pennsylvania, encouraged a sense of urgency in revitalizing PK-12 Catholic education in America. I’m looking at the cavalry, and you’re it. You, the people presently engaged in this movement – and those around the country like you – are the last and best hope for Catholic schools. — John J. Dilulio, Jr. The symposium also featured a case study presented by James V. Morris, Chair, and James K. Paul, Vice Chair, of the Board of Specified Jurisdiction for Our Lady of Mercy Regional Catholic School (Maple Glen, PA). They spoke on Connecting Mission and Vision and the school’s approach to change. 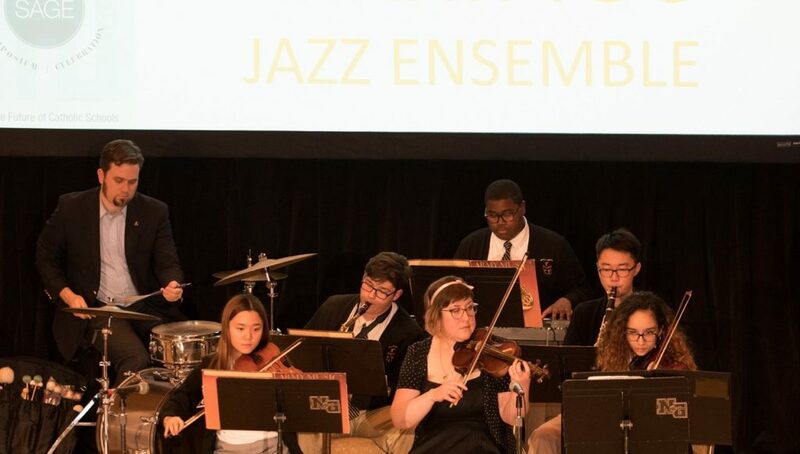 A spirited and celebratory performance by Saints Neumann and Goretti High School (Philadelphia) Jazz Ensemble opened the evening’s Celebration of Achievement ceremonies. 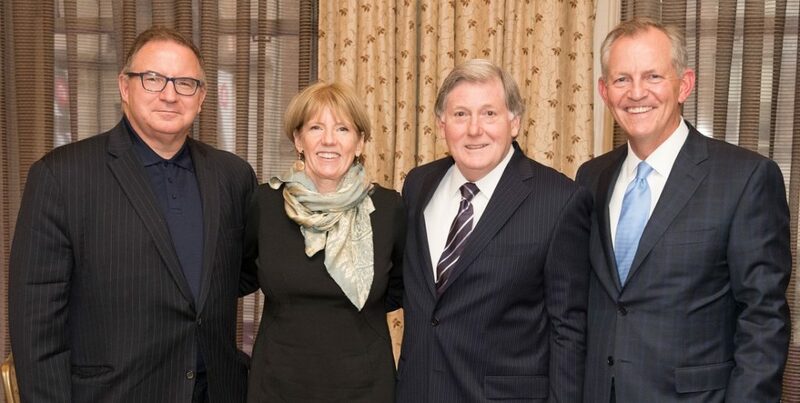 These ceremonies offered insights from the Healey Education Foundation leadership team and guest speaker, Gail Dorn, President of the Catholic Schools Center of Excellence (CSCOE). Dorn shared how CSCOE is improving excellence and enrollment for the 79 PreK-8 Catholic grade schools in the Archdiocese of St. Paul and Minneapolis. She spoke about the importance of understanding the customer, particularly the millennial parent, and to communicating what is unique, different and true about Catholic schools. “Our great legacy is to produce critical thinkers with mature moral values,” she said. Following the presentation of the enrollment, fundraising and specialty awards, emotions ran high when Robert T. Healey, Sr., Founder and Trustee, Healey Education Foundation, presented the Founder’s Award along with his daughter Christine L. Healey, President. St. Anne School (Bethlehem, PA) received the distinguished honor. Also see the SAGE 2017 Photo Gallery and Video Winners Gallery. Healey Education Foundation, a 501(c)(3) nonprofit, invests in PK-12 Catholic schools. The Foundation provides a high-impact program delivered through a coaching relationship with dioceses and schools that are ready to embrace change. Healey’s work For the Future of Catholic Schools empowers grant recipients to deliver sustainable results through effective governance, enrollment management and fundraising. Since its establishment in 2004, the Foundation has grown to serve nearly 70 elementary and high schools across six dioceses in Delaware, Maryland, Minnesota, New Jersey and Pennsylvania. The SAGE awards ceremony and networking experience empower and strengthen the resolve of the community working to revitalize and rejuvenate pride in Catholic schools. In the five years since the premier SAGE event, the Foundation has worked with partner schools to implement enrollment strategies that have impacted over 60,900 children. Also in that same timespan, with the Foundation’s help, partner schools have raised more than $15 million in mission-based revenue through their annual funds.